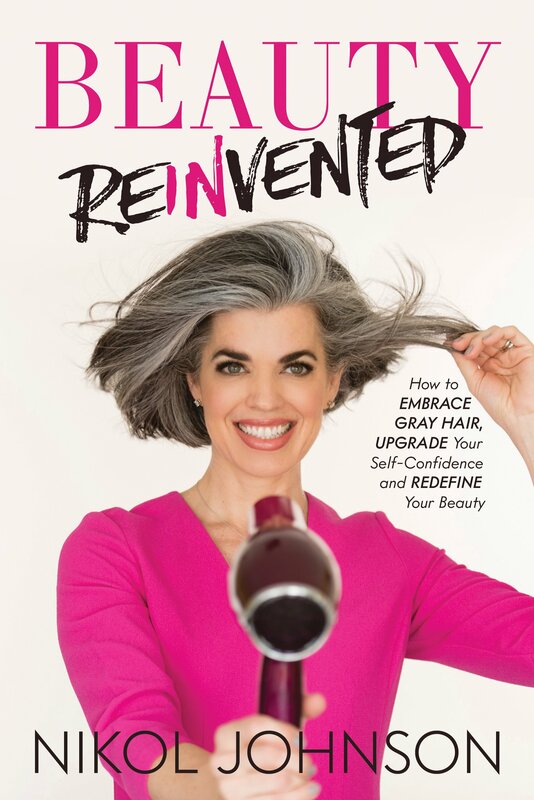 Beauty Reinvented incorporates a workbook format that will help prepare the reader for all of the ups and downs of going gray. In Beauty Reinvented Nikol Johnson, On-Air Beauty Expert, licensed Esthetician, and former Ford model, breaks the “you must never show a gray hair” beauty rule and share her journey of going gray in her thirties. The book also includes eight powerful Q&A’s from other women that have decided to embrace their gray hair. Allure Magazine states in January 2018 that “Gray Hair is Set to Be 2018’s Most Popular Hair-Color Trend.” If you ask the women that are tossing the dye box and instead purchasing Beauty Reinvented, gray hair is not a trend, but an empowering decision. Nikol knew she was onto something big with helping women embrace their unique gray hair journey and beauty she when she was picked as a runner-up in People Magazine’s 2016 Natural Beauty Search. One of Nikol’s fastest-growing videos on You Tube is her “Gray Hair Journey”, with over 200k views. 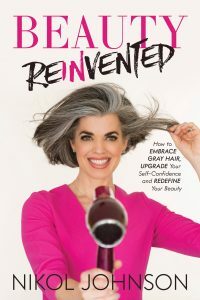 Some of the highlights of Beauty Reinvented include “Developing Your Gray Attitude” in chapter 4, and down-to-earth, informative advice in chapter 5: “My 5 Strategies to Going Gray”. The book is rich with personal anecdotes, and infused with Nikol’s expert advice on how to upgrade one’s skincare and makeup routine throughout the gray hair journey. The reader will be encouraged, educated, and inspired to embrace her own gray hair. On-Air beauty expert, entrepreneur, licensed Esthetician, and founder of Fresh Beauty Studio and Beauty Reinvented Nikol Johnson rocked the beauty world when she decided to liberate her gray hair at thirty-nine. Breaking the beauty rules for Nikol came with a little hesitation. In the world of beauty where being young and wrinkle free is Queen, how would the world react to a woman willingly letting her hair go gray and just turning forty? Working as a FORD model since the age of fifteen and being told by the industry to be everything but herself, Nikol eventually decided to own her beauty and let the gray out. Before her gray hair journey, Nikol launched Fresh Beauty Studio in 2006 and has spent the past twelve years creating gorgeous faces at her boutique makeup studio in South Florida. There she concentrates on advanced permanent makeup techniques, airbrush makeup, and flawless skin, giving hundreds of women confidence and style through beauty and education. Runner-up in 2016 People Magazine Natural Beauty Search, Nikol knew she was on to something big with helping women embrace their unique gray hair journey and beauty. One of Nikol’s fastest growing videos is her Gray Hair Journey with over 200K views. As a niche social influencer, Nikol has over 3 million views on her beauty YouTube channel. She reaches tens of thousands of women across her social media platforms who are looking for a change in the anti-aging beauty industry.